My wonderful Super H-mart experience prompted a luncheon food excursion to 2 other ethnic grocery stores with much lauded food. yes, i had 2 lunches today! they don't call me neverfull for nothin! My first stop was Asia Market in the Heights. i first read about this place in the Fearless Critic Houston Restaurant Guide. But after seeing the photos that anonymouseater posted on his blog this week and rereading his previous review, i suddenly felt the need to get out there ASAP. (i actually attempted to go last night, but they close at 7 pm). 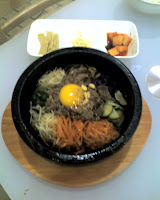 The website (i was surprised to find one) lists 10 menu items, however the menu i found in-store boasts 6 salads, 4 soups, 5 noodle dishes, 5 rice dishes, 5 curries, 2 vegetable dishes, and 10 specialty items. the menu also says 'let us know if you would like to try something that's not on the menu.' there were a couple thai women behind the register where you place your order and pay for groceries and a congenial african-american gentleman who took our order. he seemed very helpful and knowledgeable about the menu. we ordered the tom kha soup w/shrimp, pad kee mao noodles w/chicken (thai spicy), and the kang keaw wan w/ pork (green curry). when we tried to order the green curry thai spicy, he looked at us like we were crazy and said it was already really spicy. 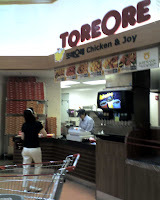 we took his advice and ordered it "normal" or farang-style ('farang' means the same thing in thai as 'gringo' does in spanish).it took about 15-20 mins before our food started coming out which gave us ample time to explore the grocery store. there were lots of homemade desserts on a table near the dining area and some interesting savory snacks as well. since we knew we had 2 stops for lunch, we had to show some restraint and pass on them. 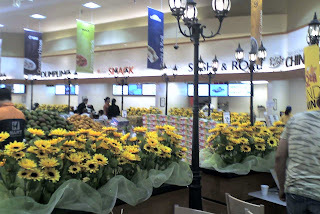 the dining area was larger than i expected and was on the front side of the store. there were 8 small tables with 2 chairs at each. another long table contained styrofoam plates, eating utensils, and various condiments such as sriracha, pickled chilis, and chili sauces. the kitchen is almost completely open and there was a cute older couple that seemed to be chef and sous chef. ventilation was good b/c there was no noticeable greasy stirfry smell about the place.the first dish that came out was the pad kee mao. it was delightfully spicy but we still added some srichacha. i could have taken a little more heat, i think the kitchen was being easy on us. this dish was amazing and had a wonderful fresh basil flavor. i also love anything with egg in it. i was literally dancing in my chair. 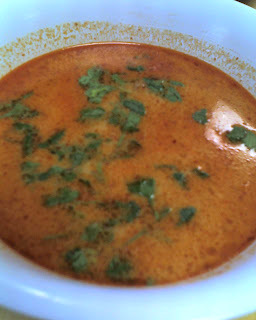 next up was the tom kha w/shrimp that arrived right before we were done with the pad kee mao. 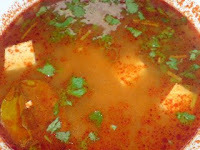 i have a photo of the soup innards below too. 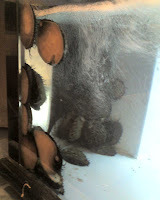 the baby shrimp, although plentiful, was obviously the cheap frozen stuff. my dining companion even remarked that he preferred a couple big shrimp to a bunch of little ones. i'll get the chicken next time, but the flavor of the soup was wonderful. it had a lot of coconut milk in it and the flavors just exploded in my mouth. i still can't decide if i like vieng thai's version better. VT's is more savory and delicate. AM's is loud and vibrant. 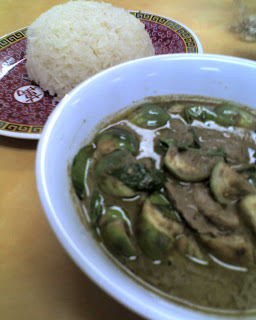 we closed the delicious meal with the green curry w/pork (see above photo). again the flavor profiles were amazing. 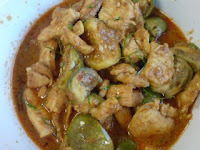 the green tomatillo-esque objects are thai eggplant which comes in all their curry dishes. i've just recently fallen in love with eggplant in the past couple years, used to hate it as a kid, and after seeing anonymouseater's photos of it, it was my number one reason for coming out. the eggplant itself disappointed. it didn't taste like much and the outside of the vegetable was so hard that it was sometimes difficult to chew and swallow. the curry itself was glorious. we substituted sticky rice for white rice. i was so excited about this meal that i had to tell my friend about this place. he was the person who introduced me to vieng thai for the first time. he was so excited about it that we went to asia market for dinner. i have to say that round 2 of asia market was not as impressive. it was funny going back only 4 hours later and the employees were happy to see me again. we ordered the som tum. i had previously read that the som tum was better at VT in the fearless critic houston restaurant guide. i've only had it thai style at VT; the funky laotian style with purple crunchy crabs was even offputting to robb walsh. i had hoped to try the laotian style here w/shrimp paste, but when i asked the thai woman behind the counter which was better she said "thai" w/o even a second thought. well, the fearless critic was right. 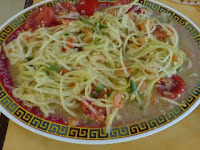 VT's som tum blew AM's away although i did like the halved cherry tomatoes in this version. i have a feeling that i would have preferred the laotian style here. my dining buddy ordered the tom yum soup w/tofu. i'm not a big fan of this kind of soup, it is a little too tart for my taste, but i did enjoy a small bowl. he loves the stuff and i've shared an order with him at VT too. he is the better judge on this subject and based on his decision, again VT's triumphed over AM's. 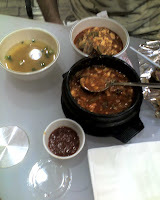 my only critique was that the tofu was overcooked in the soup. i generally enjoy tofu in all its forms (dried, fresh, pressed into bean curd, fried) but i did not enjoy this one. next up, pad thai. 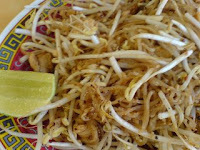 this is a dish that i generally order at americanized thai places and i enjoy it for the raw bean sprouts. i have never ordered it the many times i've been to VT, but the fearless critic said this version was the best in town. 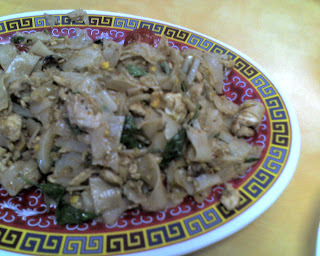 it was served with crushed peanuts, bean sprouts, a lime squeeze, and roasted chili flakes on the side. i forgot to take the photo before we mixed it all up. my expectations may have been too high after the pad mee kao noodle dish earlier, but this was the most disappointing dish yet. it was dull and bland compared to all the thai spice goodness from earlier. what a beautiful photo though, huh? my friend took all thephotos from this trip. i can't take credit for any of them. lastly, i wanted to order a curry. the counter lady told me to get the panang. we ordered it with chicken. it was my second chance with the thai eggplant. again, they were too hard to eat. i found myself longing for the penang with green beans at VT. the curry itself was good however, but not that memorable.i know i didn't impress my dinner guest on this visit. i promised him we would come back again and experience the heavenly pad kee mao or try something really authentic like the Koa Nam Tod (fried rice w/ nam sausage) that a friend of mine who spoke thai recommended when we ran into her earlier that day. there's also an intriguing fried quail listed under their specialties that deserves a try. my second stop for lunch today was gerardo's drive-in. i have to admit i was a tad full leaving asia market. i couldn't stop eating because the food was so good, but my lunch companion was game to follow through with our plan. 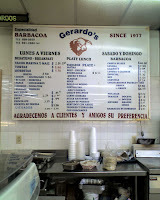 gerardo's was a short drive away on the other side of 45 near irvington. we didn't get there until about 3 pm. 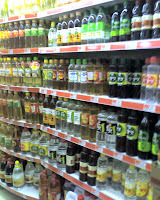 we arrived at a mexican convenience store. the "deli' was in the back of the store. their condiments bar was put up but they seemed happy to serve us. the menu was hung on the wall, but i knew exactly what i was ordering. click on the photo of the menu to enlarge. i came for barbacoa. i had the lamb version at hugo's last week. it was too lamby and not quite unctuous and greasy enough. i was looking forward to this, but the barbacoa looked like it had been sitting out for awhile in the steam table. 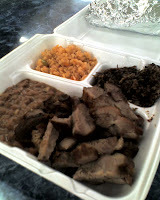 a huge tray of carnitas still boned filled me with more hope. mmm.... carnitas! 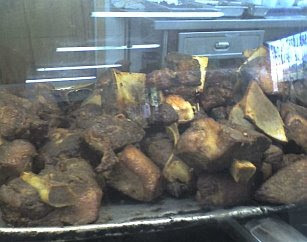 then we spied some huge hunks of chicharrones on another tray (why didn't i get a photo?). they looked like thick, huge slabs of deep fried bacon. the older man behind the counter told us to try some when he saw our eyes pop out at the sight of them. he instructed us to heat them up in the microwave in the dining area. hey, what's better than deep fried fat? split the lunch plate w/ 2 meats and the obligatory rice and beans. we came for the barbacoa and carnitas based on robb walsh's review of the place last year. the older man behind the counter was happy to give us both corn and flour tortillas. we also asked for some fresh onion and cilantro and they gave us a boatload of it. 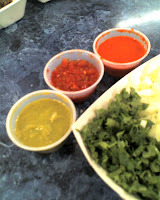 we were given 3 salsas. the green one was fantastic! all the food was about room temperature except for the warm tortillas. in hindsight, we probably should have nuked everything in the microwave sitting in the dining area. the carnitas did have a good crispy texture which was what i was looking for even if they were cold. my friend and i both decided we would come back again during prime lunch hours. btw, barbacoa is only served on friday, saturday, and sunday and i hear the place is crazy on weekends. le mistral is my new favorite french restaurant in houston, my only complaint is that it is so far away! who knew there were restaurants of this caliber in west houston? the escargot, lobster bisque, fois gras terrine were all good as expected. the ribeye and seared chilean sea bass was delicious bite after bite. but the star of the menu was the beef wellington served in a morel sauce -- and the morels are definitely present. the puff pastry and duxelle perfectly buttery. the beef is tender and cooked to perfection. this is now one of my top 10 dishes in houston. in general, the prices seem a tad bit high for the location (strip mall in west houston) and ambiance (which is a little lacking), but the $32 for the wellington was worth every penny. on a sunday night, service was slow and not as attentive as we would have liked, but we were a table of 7 and 20% gratuity was included on the bill which may explain the lack of the servers’ attention. i pine over that beef wellington, even to a point that i decided to attempt to cook it myself for a dinner party. of course, it was not as good as the professional version, but i definitely appreciate all the prep and work that goes into constructing the dish now. and i learned that central market will sell you a portion of the huge $100+ pieces of fois they have vacuum sealed on their refrigerated shelves. i was out in sugar land last week and needed a spot for dinner. i remembered reading a review of AURA on the foodinhouston blog. this little gem out in missouri city made the chronicle's #4 best new restaurant in 2007. it's a good 35 min drive from downtown w/o traffic and only 10 mins from my location in sugar land. as an inner looper, i now find myself jealous of the folks living further south. i ordered the pate et terrine maison to start. it was not on the menu that evening, but our server said it was available. for $9.50, the appetizer consisted of 2 large slices of pork terrine and a small crock of fois gras pate. at first i found the pate was a little too salty for my taste alone on the french bread, but i found that layering pate with healthy piece of terrine and topping it off with dijon mustard made a delicious bite. my dining companion was vegetarian. i surprised myself by eating half of the plate and i found myself feeling guilty that i enjoyed it so much while my friend only sat and watched. steak tartare - on both menus, $16. good quality beef. raw chicken egg yolk on top. little piles of chopped shallots, deseeded jalapeno, sea salt, capers, dijon mustard, and also something red (some kind of dried pepper) on the side. we mixed everything together and the result was oversalted. toasted french bread slices provided. it was decent, not great. we expected more flavor and heat. my friend and i agreed that the steak tartare is better at capital grille (no longer on the menu, but can still be special requested). fried shrimp w/ lobster roe tartar sauce - bar menu, $14. this dish made the houston press best of 2007 list for best fried shrimp. served with coleslaw which was a little too vinegary for my taste. the tartar was nothing special. the fried shrimp was good, but to be perfectly frank, i like the ones at barbeque inn better. i would easily order it again but with fries next time. roast suckling pig - dining room menu, $29. coconut pineapple broth, sliced roasted pineapple, yucca mash. amazing dish. the pork was very tender. i wish the pork skin was a bit more crispy, i will request this next time. seared ahi tuna w/ chorizo & radishes - dining room menu, $34. i only had a bite of it and it tasted dull and bland to me. however, my other dinner companion enjoyed it. onion rings, bar menu $6. yummy, although the "ketchup" they provided was too runny and sweet. very similar to a tempura batter. great experience there tonight w/o breaking the bank. i definitely recommend sitting at the bar for a more casual experience. i look forward to trying the famous black bean terrine there on my next visit and it will be hard to convince me to order something other than the roast suckling pig which is now easily one of my favorite dishes in houston.